I forgot to review this series from my tropical vacation last May. Light and entertaining, pairs perfectly with the beach. 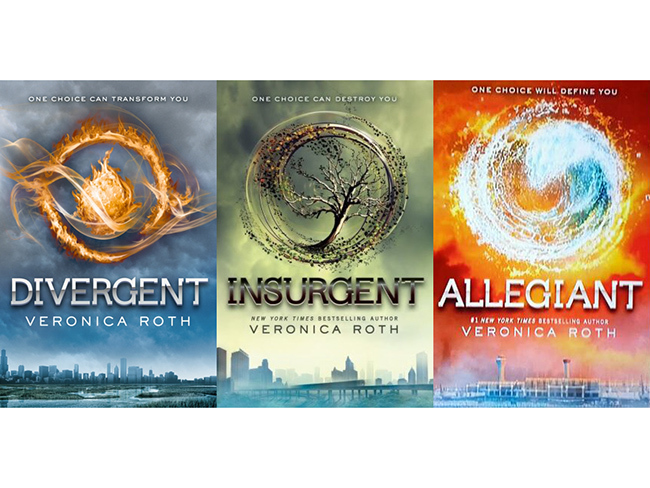 In Beatrice Prior’s dystopian Chicago world, society is divided into five factions, each dedicated to the cultivation of a particular virtue—Candor (the honest), Abnegation (the selfless), Dauntless (the brave), Amity (the peaceful), and Erudite (the intelligent). On an appointed day of every year, all sixteen-year-olds must select the faction to which they will devote the rest of their lives. For Beatrice, the decision is between staying with her family and being who she really is—she can’t have both. So she makes a choice that surprises everyone, including herself. Tris also has a secret, one she's kept hidden from everyone because she's been warned it can mean death. And as she discovers unrest and growing conflict that threaten to unravel her seemingly perfect society, she also learns that her secret might help her save those she loves . . . or it might destroy her. I really enjoyed that it was set in Chicago, because I travel(ed) there frequently over the past few years and know the landscape pretty well. This is a plot-driven story, fun and fast-paced and not too philosophical. Similarly to Hunger Games, the part that dragged on for me was related to the romance, but that's what sells to the tween crowd so just skim through it and carry on. I thought the concept was pretty unique. For a beach read, this is just what I'm looking for- pure entertainment and some good creativity.